My sister in law Terry was here last weekend and brought me several pounds of rhubarb. I've never been a big rhubarb fan. My early memories of rhubarb are my mother stewing rhubarb with sugar for my dad. He loves it that way, all I can say is YUCK. Instead of making my husbands favorite rhubarb dessert using a yellow cake mix, I decided to try a new receipe. If rhubarb is mixed with strawberries, I find it a bit more palatable. 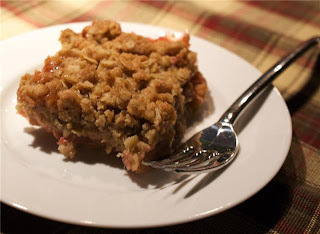 I did some searching and found this Strawberry Rhubarb Crisp recipe and changed it just a bit. Topping:Combine all of the ingredients in a medium bowl. Using a pastry blender or your fingers, mix the ingredients together until large crumbs form. Bake for 30 minutes. Reduce the oven temperature to 325° and continue baking for about 30 minutes longer, until the fruit filling is bubbling and the topping is nicely browned. Let the crisp rest for 10 to 20 minutes before serving.